A ceramic conditioning ring is used to charge the diamond powder in the slurry sprayed over a lap surface plate evenly on the surface plate. Use of a ceramic ring allows efficient fixing of diamond powder to prevent chipping or scratching. ※These are the specifications of S type based on stainless steel. 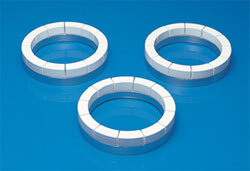 ※A ceramic conditioning ring of other size can be separately quoted upon request. Copyright (C) 2011 ENGIS JAPAN Corporation. All Rights Reserved.